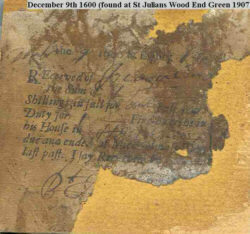 Fragment of a hearth Tax certificate dated 9 December 1600 and found in St. Julien’s House, Wood End Green in 1907. The Hearth Tax of 1662 was enacted 13-14 Charles II. c. 10. The tax required that each owner or occupier of any house, lodging or chamber was obliged by 31 May 1662 to deliver an account in writing to the constable(s) (or headborough(s) or tythingman/men) of all hearths and stoves within the house. The constable was then to immediately enter the house (during the daytime) to verify the return. Where there was no occupier, a written notice was fixed to the door by the constable who was to enter the property within six days to make his own assessment. Consequently the tax included occupied and unoccupied buildings. The justices were next required to cause the returns to be enrolled by the clerk of the peace for the county (or riding or division), and the clerk additionally to make a transcript on parchment, to be delivered into the Exchequer within a month from the receipt of the returns from the constables. So there are few areas of England for which the full 1662 hearth tax returns do not survive, either in the National Archives or in the county record offices. The first payment was due 29 September 1662. No person who was exempt from church or poor rates by reason of poverty was required to pay the hearth tax. 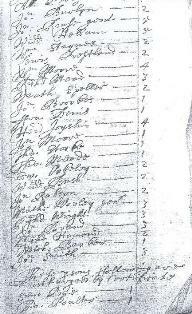 Additionally, the parish poor law was used to identify further households inadequate to pay the hearth tax. If the churchwardens and overseers of the poor, together with the minister of the parish (or any two of them, the minister being one) certified in writing to the two nearest justices of the peace that the house was not worth more than 20s a year upon the full improved rent, and that neither the householder nor anyone using the property had, used or occupied any lands worth 20s a year, nor had any land, goods or chattels worth £10 or more, that house was to be exempt from the hearth tax, and the householder was not to be listed in the return made by the constable. So, apart from this last provision, which was at first rarely invoked but became commonplace later, the hearth tax returns should, in theory, give a complete list of householders, including those unable to pay the tax, in the summer of 1662. This is a key moment for those genealogists who have been relying mainly on baptisms, marriages and deaths from the parish registers to reconstruct their family trees, because most parish registers were disrupted - or are even completely lacking - from about 1640 to 1660, the Civil War and Commonwealth periods.The Hearth Tax was levied between 1662 and 1689. The rate was two shillings (10p in today’s money) per annum for each hearth in a building. The record for 1662 has been transcribed and is much easier to read than the photocopy of the 1671 original. Copies of both are at the county archive in Chelmsford. 1673 Hearth Tax Uttlesford hundred: Henham. 34 names; 35 hearths. National Archives reference number: E 179/328/717. Manuscript. 2 folios in book form. Particulars of Account and other records relating to Lay and Clerical Taxation. 1673 Hearth Tax Uttlesford hundred: Henham. 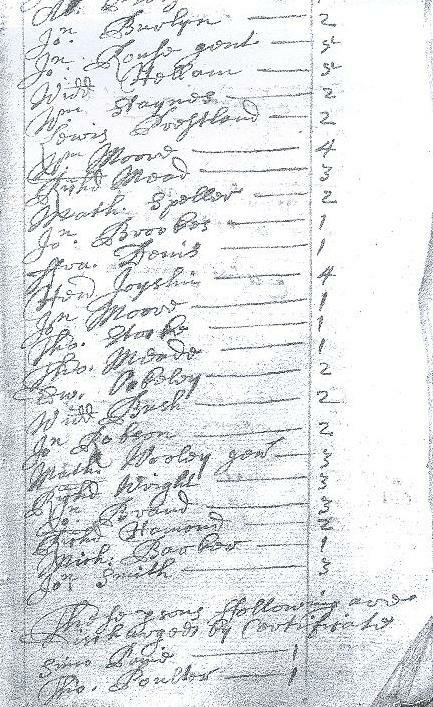 42 names; 44 hearths. National Archives reference number: E 179/328/716. Particulars of Account and other records relating to Lay and Clerical Taxation.